Russian Champion, 1899, 1901, 1903. Founder of the Russian school of chess. He was the first public chess worker, organizer, and journalist in Russia. His first chess magazine, "Chess Sheet," only had 250 subscribers in all of Russia. 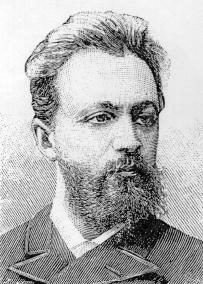 From 1878 to 1907 he was considered the best Russian chessplayer. In 1889 he unsuccessfully challenged Steinitz for the world championship in Havana, which ended after 17 games and only one draw. Steinitz had won 10 and lost 6. A month later Tchigorin won America's first international tournament, New York 1889. He took second place in the Hastings 1895 tournament (behind Pillsbury) and won the first three All-Russia tournaments (1899, 1900-01, 1903). At Hastings 1895 he won a ring and a copy of Salvoli's THE THEORY AND PRACTICE OF CHESS for winning the most Evans Gambits.